Remote control system to prevent opening of the rear doors using their interior controls and use of the rear electric windows * . 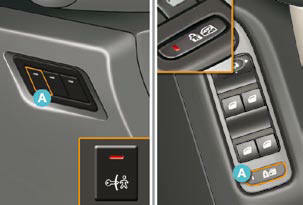 - or on the driver’s door, with the electric window controls, on versions fi tted with rear electric windows. The indicator lamp on button A comes on, accompanied by a message on the multifunction screen. This indicator lamp remains on until the child lock is deactivated. The indicator lamp on button A switches off, accompanied by a message on the multifunction screen. This indicator lamp remains off until the child lock is activated. Any other status of the indicator lamp indicates a malfunction of the electric child lock. Have it checked by a CITROËN dealer. In the event of a serious impact, the electric child lock is deactivated automatically to permit the exit of the rear passengers.